that will Enable You to Cook Just About Anything? Recipes and traditional cookbooks are nice for ideas, but how much faster and more fun would it be if you could just walk into your kitchen and whip up a great meal, using anything you had on-hand? And How Much Time and Money Would You Save? Have you ever discovered a great new dish at your favorite local restaurant, but when you tried to re-create it at home, you didn't even know where to begin? You probably thought to yourself you needed to get a copy of that restaurant's recipe to even think about making it at home. But, the truth is that a recipe probably wouldn't help you that much. Because there is something missing in every recipe you've ever read... But not for long! You are about to discover the secrets that most cooks don't know about. You are about to learn how to easily master the basic cooking methods used by professionals, and use them every day in your own cooking to make it better, faster, easier and a lot more fun! How would your life change if you didn’t have to spend so much time planning out every meal or so much money on take-out? How would you like to be able to whip up delicious, healthy meals using what you have on hand without having to spend lots of money and time shopping for hard-to-find ingredients? How would it feel to have your family look forward to dinner every night when you're cooking? Before I went to culinary school, I wondered all of the same questions. I wondered why I was able to cook my five "go-to" meals, but everything else I attempted was "hit and miss". I wondered why, despite my huge library of recipe books, I still wasn't actually learning much about cooking, and every new "recipe" I tried was like starting out for the first time. Then in culinary school I realized what was really going on. I learned that recipes are great for getting ideas, but without understanding the Basic Cooking Methods that are actually the basis for every recipe - cooking is more of a guessing game than a science or an art! It wasn't until I started teaching others to cook using Basic Cooking Methods that I realized this is a common problem that almost everyone cooking today faces! When I started showing others how easy it was to cook by method, something amazing started to happen. People Told Me This Changed Their Lives! More and more people kept telling me how learning to cook by method had improved their health, happiness and LIFE! It was at this point that I decided I wanted to get this information out to the world. And there has never been a better or more urgent time to learn to cook! There is a growing awareness about food as well as a growing trend towards cooking meals at home again using whole foods and "real" ingredients - not to mention all of the health concerns surrounding prepared foods and even take-out. We as a society are starting to realize we need to make a change. 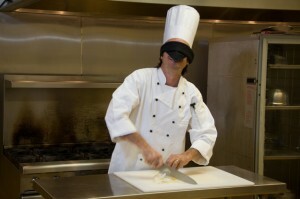 Chef Todd, How Can I Learn Basic Cooking Methods for Myself? The exciting news is, it really isn’t hard to do when you follow my proven cooking system - the same system that has taught thousands of cooks all over the world. That is why I am releasing my new book, The Basic Cooking Methods Manual, so that you can quickly and easily master these essential cooking techniques. Cook a delicious dinner FAST any night of the week using the ingredients I have on hand. Discover a great new meal idea from a cookbook, restaurant or magazine and easily create my own version of it at home. Entertain family and friends with confidence. Shop at local Farms and Markets, purchasing the best ingredients possible, confident in my ability to put them to good use. Save time and money - the two most precious commodities on EARTH! Enjoy a healthier relationship with food because I can cook whatever I want and am no longer a "victim" to what's readily available on the take-out circuit. Eat awesome food day in and day out for a fraction of the cost of restaurants. 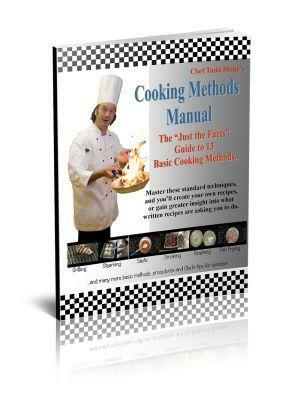 *Pay just $1 for the Introduction to Cooking Methods Guide Book plus a 15 day trial in Web Cooking Classes. Continued membership is $47 per month. Cancel anytime. 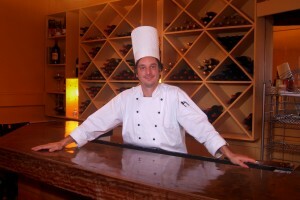 Chef Todd, Web Cooking Classes sounds amazing, how does it work? Web Cooking Classes is not your typical online video cooking program. Web Cooking Classes is not just another online video cooking library with tons of recipe videos but no clear direction or instruction. It is not a dry, complicated cooking course created for culinary students. And Web Cooking Classes is definitely not another set of recipes that may or may not work under you unique cooking conditions at home. There are 3 modules of weekly cooking lessons that take you step by step through the process of learning to cook by method. Each module will last 16 weeks and includes access to our members area, where I hang out A LOT answering questions and sharing ideas with Members so I can walk you through everything step-by-step and we can go over any questions you might have. You will receive a new video cooking lesson each week for as long as you are a member complete with videos, tutorials, homework assignments (don't worry, it's fun homework! ), and printable handouts to use to create your own complete cooking reference book. With trial and error, I've found that this system is the fastest and easiest way to learn to cook because you get to learn, practice and master one basic cooking method at a time, while discovering hundreds of new cooking ideas per method! 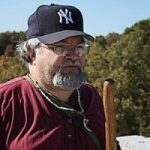 My students don't get frustrated, tired of the lessons or burnt out from too much information, which is often what happens with other online video cooking programs that basically open up a library of unrelated recipes and techniques for you to sift through. With Web Cooking Classes, you learn only what is necessary to cook fast, easy, impressive meals at home! In your 15 Day Trial, you will learn 3 Cooking Methods inside and out, and if you decide to cancel then - no problem. You've just learned these three methods for FREE! How to make any sauce known to man by learning the 5 Mother Sauces, usually ONLY taught in culinary school! How to make Soups and Stocks from scratch, using ingredients from other meals so you are always maximizing your food budget and cooking smart! The most important skills any cook can learn: Knife Skills so prep time becomes fast and fun instead of tedious and frustrating. How to make all kinds of Homemade Pasta and how you can easily create custom pasta combinations anytime. The art and science of Baking, something even great cooks struggle with! And so much more than I can list here! If you're still with me, I know you are really interested in tapping into these Chef Secrets and Basic Cooking Methods that will transform your cooking from frustrating, time-consuming, expensive and disappointing to fast, easy, fun and delicious! And I've made it so easy to get started by offering my "jump-start" guide: Introduction to Basic Cooking Methods. You see, it's hard to accurately describe the value of the information in this book because it is not available anywhere in such simple, straight-forward, cut-to-the-chase form. But I can tell you, it took me at least a semester of culinary school to learn it and many years of teaching others to perfect the most simple system on the planet for learning to cook in the convenience of your own home. How Can I Offer So Much for So Little? I thought about charging $100 for this book because I think that's a fair price to have the massive amount of cooking information available drilled down for you into one simple guide that is quick to read and easy to follow. This knowledge has been years in the making for me and frankly, I'd like to re-coup some of my investment. But at $100, I realized that too many will be left out from this valuable cooking instruction that is so badly needed in homes all over the world. So then I thought I'd cut it in half to $50 but that still leaves too many out. Plus, I wanted to be able to offer something special for you reading this, who are really ready to go deeper into your cooking journey and simplify your life. Finally, it was my wife who told me to go as low as possible on this and throw in the 15 day trial to Web Cooking Classes for free and "put my money" where my mouth is on this Basic Cooking Methods stuff. So that's exactly what I am doing. And that is why I am offering this book at 1/100th of its value. 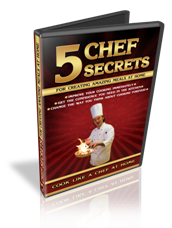 This 40 minute video shows you 5 simple Chef Secrets that will instantly transform your cooking and it's yours for free! Bonus #2: Immediate access to my Video: "Packing a Pantry for Vacation Cooking"
Instant access to a classic video which reveals how a little pre-planning can go a long way with vacation cooking! And you'll be able to watch it immediately! "Knife Cuts Practice Cheat Sheet"
"The Essential Kitchen Tools Checklist"
Full access to the Members Discussion Board where you can get ideas from others and converse with me directly! First of all, every one of my products is “change-your-life” guaranteed. If you don't love something, you get your money back—simple as that. If you aren't happy with Web Cooking Classes, for whatever reason, just visit my MEMBERS SUPPORT Tab when you are logged in to Web Cooking Classes to cancel your membership and stop your monthly billing immediately. You can also contact us directly within 30 days and receive a full refund! I'm SO excited to help you take this next step in your cooking - RISK FREE. Click here to claim your Book and Trial Membership NOW!!! - before I come to my senses and start charging a more reasonable price for this book and all of the valuable cooking methods it contains! I look forward to seeing you in the Members Area and sharing cooking ideas! P.S. Just think, you are just moments away from getting the step-by-step system that will have you cooking everything with ease and simplicity in just weeks. P.P.S Right now, hundreds of Web Cooking Classes members are waiting in the discussion area to offer you ideas and guidance as you embark on your own cooking journey. The only missing ingredient is you! 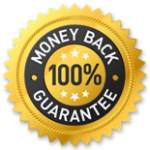 P.P.P.S You are protected by my 100% money back commitment, so all the risk is on me. Get the Introduction to Basic Cooking Methods Guide Book and Web Cooking Classes Trial Membership today while this offer lasts!